Our privately owned home, has three bedrooms, two full baths with almost 1,300 sq. ft. of living space. Families, friends or business travelers will have plenty of room. The location our home provides our guests with ease of travel to and from Orlando International Airport, Orlando's theme park attractions, sports activities, the shops and restaurants along International Drive and Orlando Outlets. This home is located close to Disney - Orlando/Kissimmee and the Central Florida attractions. Come and enjoy the freedom of a home rental rather than the restrictions of a hotel. Publix (grocery) is 5 mins away along with fast food and dining in that plaza, or use the 24 hour Walmart from less than 10 mins from the home. Perhaps you want to shop the Malls/discount outlets - there is a lot to choose from! Outback Steak House, Red Lobster, Italian Cuisine, Chinese restaurants and buffet. It is a short drive to all the Disney Parks - 15/20 mins (Magic Kingdom, Epcot, Hollywood Studios, Animal Kingdom, Blizzard Beach) or visit Seaworld, Aquatica, Universal Studios, Islands of Adventure, Wet and Wild, or one of the many Dinner shows, or the famous Cirque Du Soleil. There are many other activities to do such as mini golf, movie theatres, and Downtown Disney. The Orlando Science Center, and Orlando Art exhibits/Museums..
Bathroom Towels and Toilet Paper is provided. Detergent for Washing Machine is not included. Bath Towels only. Pool Towels are not included. There are some pots and pans provided. The property was perfect for what our needs were as a family and it was budget friendly. The house was clean, smaller than the pictures showed but big enough for our group. Towels were in short supply, and in poor condition , living room furniture was not comfortable for sitting very long. Six of us could not sit at the dining room table together as there were only 3 chairs and not enough room. We were able to sit in the screened in porch and enjoy meals together. Thank you for your feedback and we try our best to accommodate all our guest. The kitchen has a counter with 4 chairs and the small table adjacent to the counter has 3 chairs. Additionally you had plenty of chairs for your use outside (both foldable chairs and six regular chairs and a table in the screened area). Most of our guests either move our chairs according to where they want to be seating (either outside of inside). I am glad you were able to accommodate your group and make use of your stay. Thank you! The house was perfect for our family of four. It was nice and relaxing in a quiet neighborhood and centrally located. The perfect experience. This property was close to Orlando Airport and therefore close to our daughter who is a flight attendant. Many have said the property was dated but I felt it was charming and comfortable. The neighborhood was quiet. The house was very clean.The beds were very comfortable. They provided more than enough pillows and extra blankets. The bathroom showers were great and plenty of towels were there for our use. 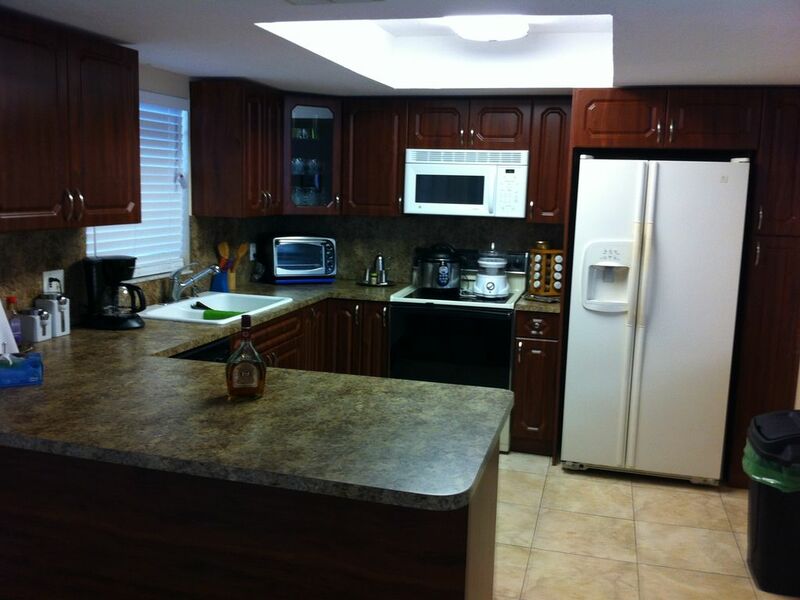 The kitchen provided all the necessities to make our meals plus a dishwasher. The pool is solar heated so in February it wasn't warm enough for me to swim but I brought pool floats and enjoyed it on the warm days. We also brought our own towels for that. A gas grill and charcole grill were provided. Parking is great, we used the garage and there was plenty of room for two additional cars on the drive. I loved our week here. I hope it is available next year when we come. The house was very nice and clean. The living room tv didn’t work when we arrived and we notified the owner and he sent someone over right away. The pool is heated by solar, so you might take that into consideration. It just so happened the weather was nice and warm the entire time we were there so we did enjoy the pool. Cleaning Fee: $85.00 Damage Protection (Non-Refundable): $49.00 Until confirmed, rates are subject to change without notice.